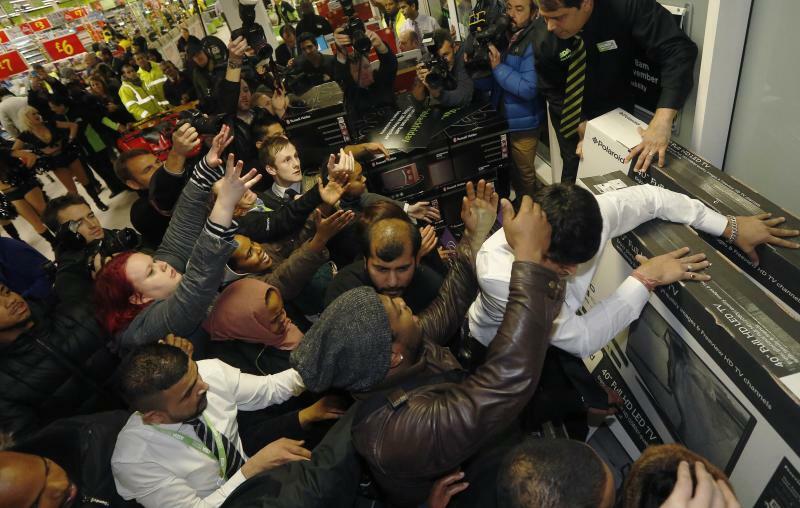 Black Friday mayhem was not limited to malls and big box stores – it spilled over onto social media. Many shoppers used smartphones to shoot the predictably chaotic scenes of bargain-hunters scrambling over discounted electronics, toys and clothes. Brawls over Barbies and tussles over TVs – same as it ever was. Musician Kevin "K.O." Olusola joked that Black Friday is the only time people resort back to our baser, animalistic instincts. The discount-shopping day is so popular that the U.S. Customs and Border Protection agency reminded shoppers to protect themselves from purchasing counterfeit goods and have proper identification for crossing the border. The police department in Methuen, Mass. reminded shoppers to be considerate and patient with each other – and that the day shift would be keeping their eyes open. In the United Kingdom, the Greater Manchester Police (GMP) announced that they had already arrested at least three people before 7 a.m. local time. GMP Deputy Chief Constable Ian Hopkins released a video addressing what his officers saw reporting to seven Tesco stores in their jurisdiction. 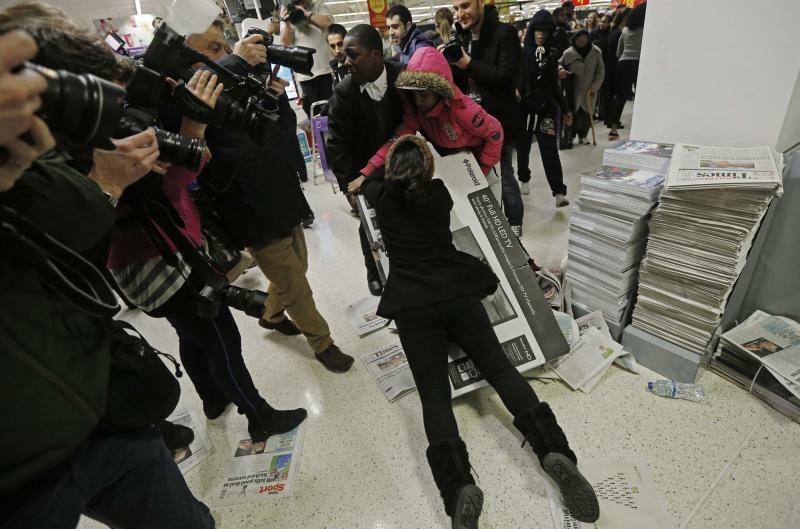 “People have been trampling on each other and it’s been akin to a mini-riot in some of the stores,” Hopkins said. Amid the disorder, a woman’s wrist was broken, a TV was dropped on someone in a wheelchair and a security guard was punched, he added. Hopkins says he told senior executives at the U.K.-based grocery and merchandise chain that store security should have been better prepared to deal with those events. He emphasized that GMP has lost 1,500 officers over the last three years and that their limited resources should not be used to “bail out stores” who have not planned effectively. Professional athletes turned to Twitter to share their thoughts on the big day. English soccer player Peter Crouch, a striker for Stoke City, weighed in on the disarray countless people watched on TV from the comfort of their own homes. Similarly, Indianapolis Colts linebacker Andy Studebaker reminded people of that apparent disconnect between the materialism seen on Black Friday and the gratitude expressed on Thanksgiving. British swimmer Lewis Coleman, on the other hand, focused on the positive by tweeting a picture of someone who looked pleased with his shopping haul. 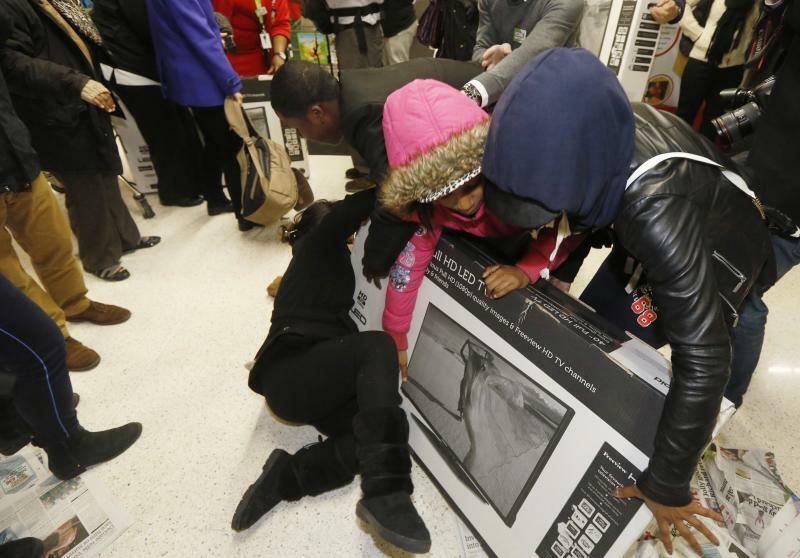 Some people outright refused to participate in Black Friday shopping to protest the controversial grand jury decision not to indict Ferguson, Mo. officer Darren Wilson in the shooting death of 18-year-old Michael Brown. Celebrities, small business owners and activists protested their non-cooperation with the big day as part of the social media campaign #BlackOutBlackFriday. Happy Chicks Bakery in Cincinnati closed shop for the day.Def Jam co-founder Russell Simmons, Rage Against the Machine guitarist Tom Morello and actress Kat Graham all voiced their support for the retail boycott. One protest inside a Walmart in a nearby St. Louis suburb attracted about 75 demonstrators who dispersed peacefully after speaking their minds as shoppers waited in line, Reuters reported. Meanwhile, photographer Jim Vondruska shared a picture on Instagram of the National Guard soldiers preparing for the worst outside one of the St. Louis Walmarts, preparing for the worst.